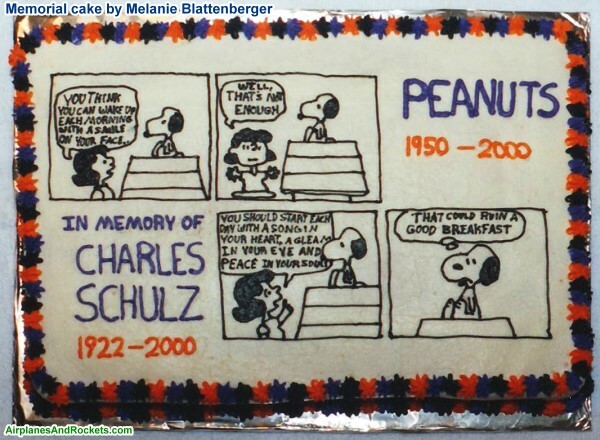 The Peanuts© comic strip, drawn by Charles Schulz, has been my lifetime favorite. 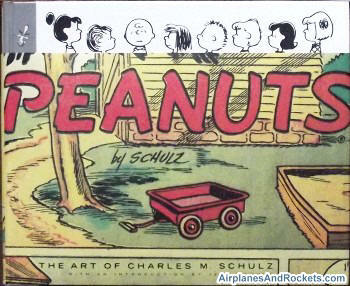 That it is also the world's favorite strip is no wonder. Now that I have crossed the half-century threshold, I tend to look back at the innocence and complexity of the themes with a perspective other than simply entertainment - although I still thoroughly enjoy reading them just to get a few good laughs. 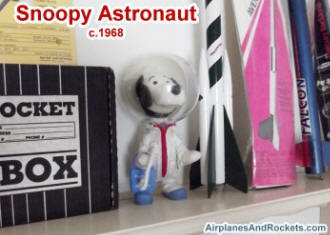 Along the way, I have managed to collect a few bits of memorabilia. 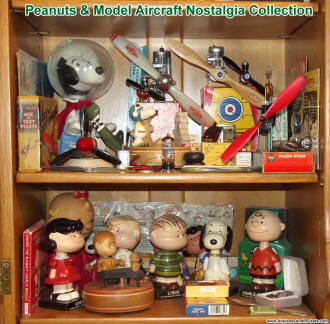 Melanie was a Peanuts fan as a child and actually still had some of her girlhood collection. 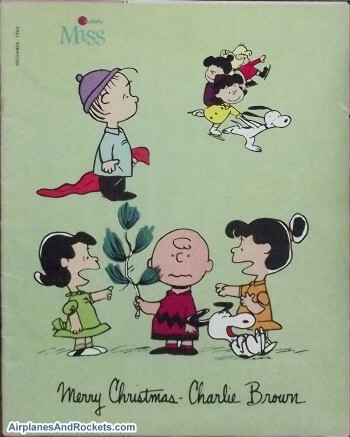 Part of her dowry when we married was a couple dozen Peanuts paperback comic books, Charlie Brown, Lucy, and Snoopy Skediddlers, the Snoopy Christmas tree ornament, a couple Peanuts banners, and a few other odds and ends. The rest of the stuff like the Snoopy astronaut and the magazines with early Charles Schulz artwork was purchased off of eBay. Schroeder, Lucy, and Snoopy Bobbleheads (aka Nodders) were added in November 2012 as well as the Schroeder & Piano toy made by Hungerford. More good stuff to be added over time. 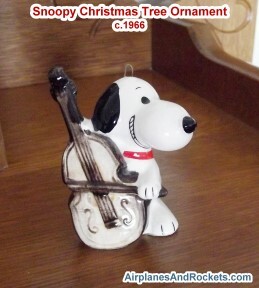 Thanks for visiting. 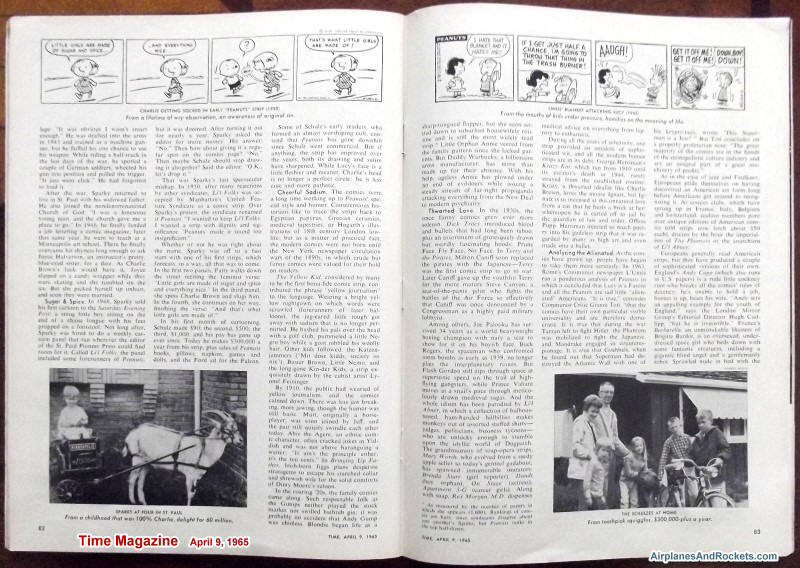 Note: One interesting tidbit that I found in Peanuts: The Art of Charles M. Schulz, is a list of the edition of The Saturday Evening Post where Schulz's first for-pay comics appeared as Li'l Folks (this link is to a page I made for the ones I have collected thus far). 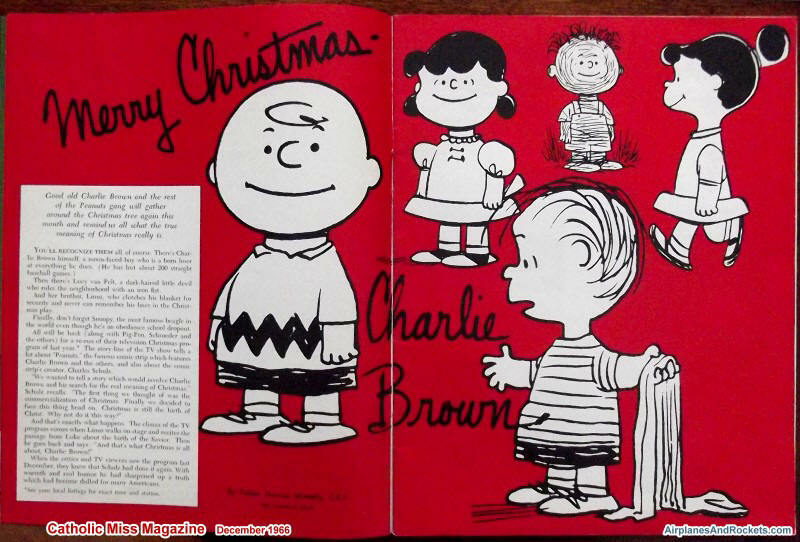 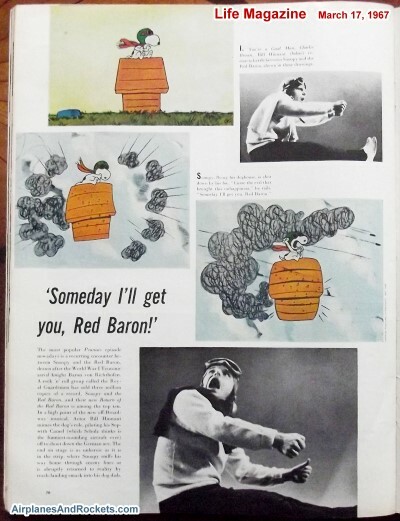 See the Peanuts characters featured in Ford Falcon TV commercials, the edition of TV Guide magazine showing the first airing of "A Charlie Brown Christmas" in 1965 and my Snoopy alarm clock restoration. This is a an amazing collection of early artwork from Schulz, including panels never seen before. 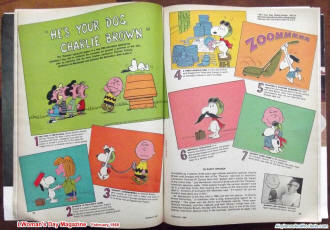 The author adds a lot of biographical information and history behind some of the comics. 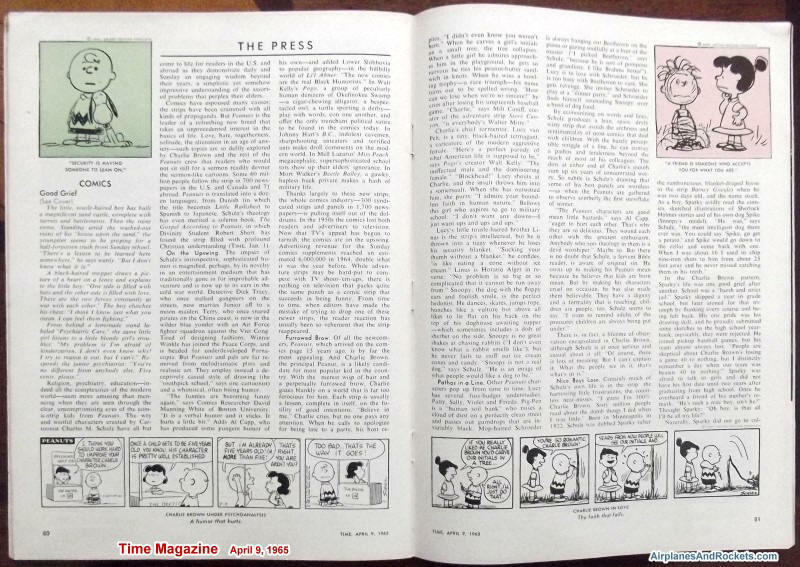 Time magazine did this article about Charles Schulz's relatively new hit comic strip on April 9, 1965. 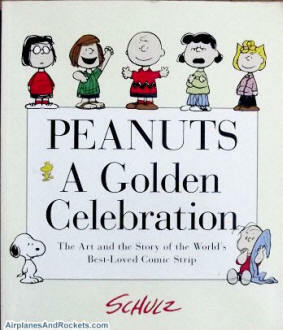 For the 50-year anniversary of Peanuts, Charles Schulz worked with a couple writers and book designers to commemorate a half century of the Peanuts characters. Schulz narrates a lot of the book himself, providing insight that could not be obtained anywhere else. 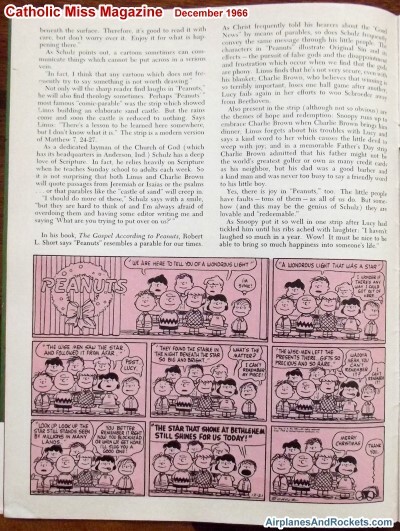 Good 'ol Charlie Brown's reputation as a loser precedes him. 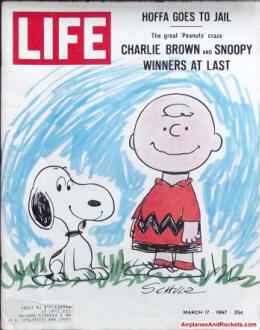 The world had found its underdog for whom to root. 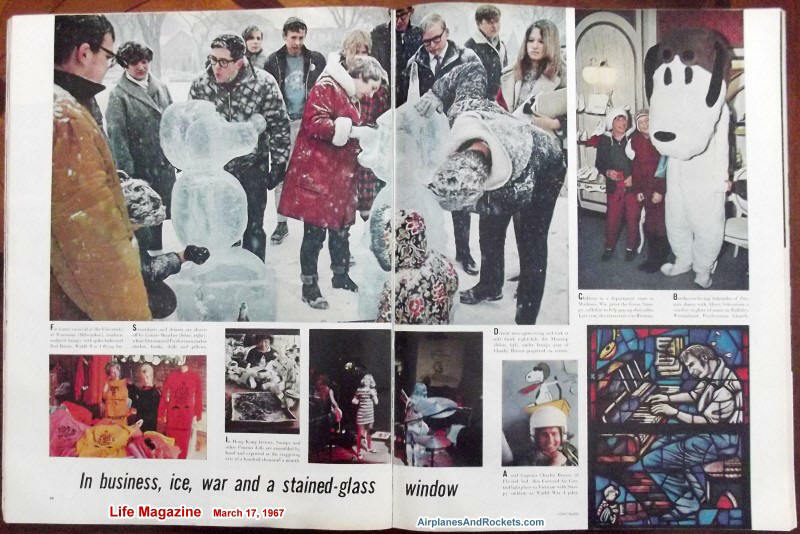 Life magazine made that point in the March 17, 1967 edition. The February 1968 edition of Women's Day magazine ran a feature on the upcoming He's Your Dog, Charlie Brown cartoon. 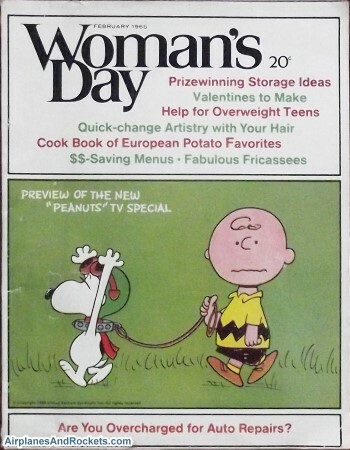 Trust me, it was hard looking at the other pictures in the magazine while looking for this article - avocado green carpet and drapes, beehive hairdos, purple hippie daisy emblems, gag! My astronaut Snoopy was bought on eBay. Ones in excellent condition with the original packaging can easily run over $300. 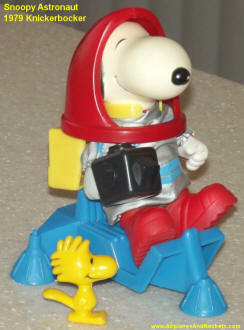 Mine has a couple cracks in the clear helmet, but is otherwise in great condition. 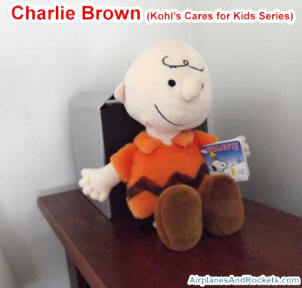 Cares for Kids program. 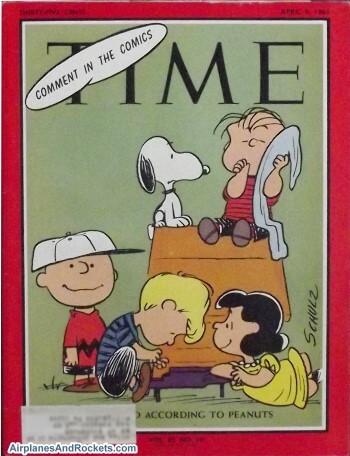 $5. 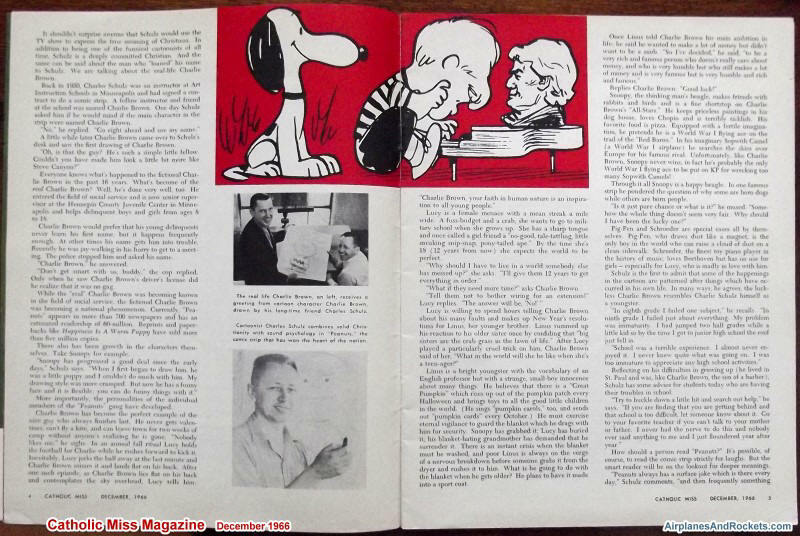 The December 1966 edition of Catholic Miss did a piece on the Peanuts Christmas cartoon special that debuted the year before. They discuss how the TV reviewers went ape-s**t over the religious theme. 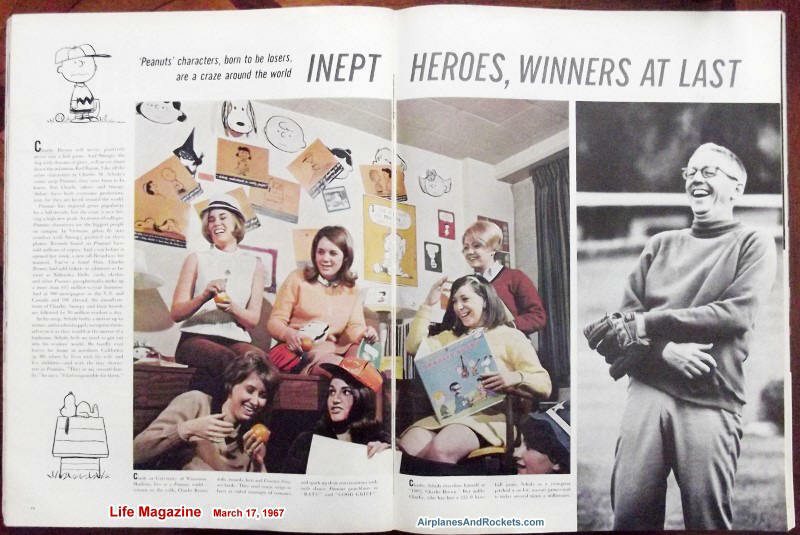 Intolerant pompous morons.